Dusting and cleaning wooden furniture is not an easy task. Materials made of wood are prone to various types of stains, dirt, grease, and grime. To make household chores such as cleaning more convenient, many companies sell cleaning chemicals. However, some commercial cleaning products may be doing more damage than we can realize. Ecological issues aside, they compromise our health and wellness. Luckily, there are plenty of eco-friendly and safe alternatives that can be made easily from everyday household products. 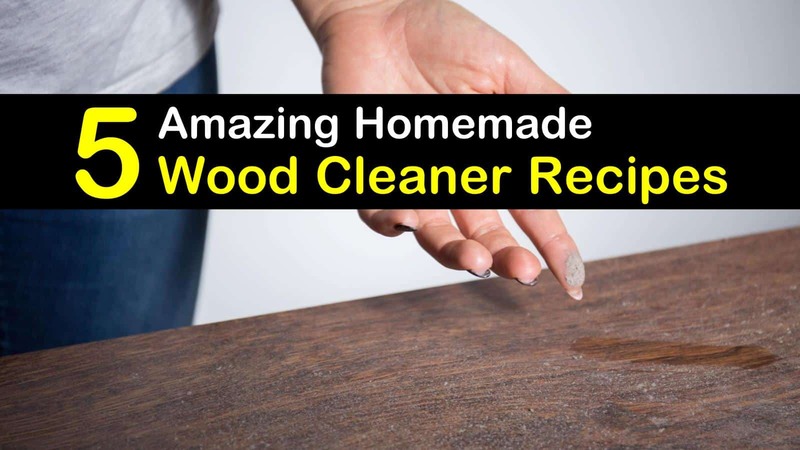 In this article, we will tackle recipes to create a homemade wood cleaner that you can use. Why Use Homemade Wood Cleaners? The following list contains recipes and solutions to help you with your DIY cleaning endeavor. The steps are simple, and the end-products are safe to use. This recipe is perfect for everyday dusting that cleans wood surfaces and removes dirt. The spraying solution smells nice, which makes your dusting spray work like an air freshener at the same time. Mix all ingredients into the empty spray bottle. Close the lid and shake well. Spray directly on any wood furniture and wipe the dust off using a soft dry cloth. Shake well before each use since oil and water do not mix well. If you do not want to use white vinegar as a homemade wood cleaner, you can use the following recipe to wipe up liquid spills and tracked-in dust on your wooden floor. Gather the items listed for your natural wood cleaner and mix all the ingredients into the spray bottle. Shake well before use. Spray into the wooden floors and use a mop with a soft cloth to apply the cleaning solution. In case you need a natural floor cleaner for hardwood decks and patios, you can also check our homemade wood deck cleaner article, detailing recipes and solutions to remove stain and dirt on hardwood floors and wooden decks. Apple cider vinegar removes grime and grease that gets stuck on wood, while lemon juice serves as a disinfectant. If combined with olive oil, these ingredients will moisturize and protect any wood surfaces. Pour all ingredients in the spray bottle. Spray it directly on the wood or on a soft cloth to apply the solution. Shake well before each application. If you want to use this recipe as DIY wooden floor cleaners with a scent, add lavender oil or any of your favorite essential oils. Water stains occur when water droplets become trapped beneath a wood polish. Fortunately, there are many solutions for removing stains and restoring wood. From strong chemicals that are available in stores or light sanding products sold in Home Depot, anyone can make old wood look like new. However, making your homemade stain remover allows you to use natural ingredients that are non-toxic and safe for home use. Remember that natural cleaners are better than commercial stain remover or furniture polish. Pour and mix the water, baking soda, and vinegar in the spray bottle. Squirt on furniture to remove the stains by removing the old varnish or furniture finish. Repaint or revarnish if necessary. If you have a lot of wooden furniture, then you know that keeping them clean and shiny can sometimes be a challenge. So, we have concocted a two-in-one recipe to do the cleaning and polishing at the same time. To make your homemade cleaner and polisher, pour all ingredients in the spray bottle and shake well. Directly spray over your wooden dining room tables or any wooden furniture and wipe clean. Remember to shake well before each use. For stubborn spots, saturate a soft cloth with the solution and repeat wiping the wood as necessary. Use with caution and do not overuse the cleaning solution. If you haven’t tried any homemade wood cleaner before, test your solution first by spraying on an inconspicuous area like the bottom or the back of furniture to avoid damage. Instead of buying expensive cleaning products online or in stores, you can make homemade cleaners from DIY recipes for cleaning wood and removing stains. Aside from saving the environment from harmful chemicals, some household products work like commercial cleaners. Plus, DIY wood cleaners are not harsh on wood and are budget-friendly. 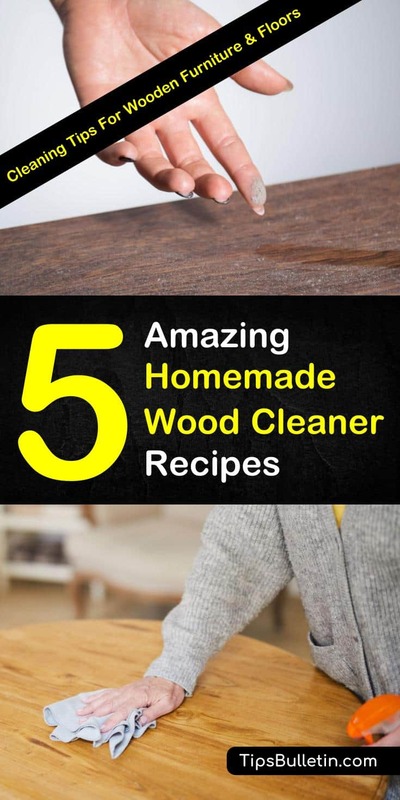 If you found these DIY wood cleaner recipes useful, please share these effective and green cleaning recipes with your friends on Pinterest and Facebook. Spread the word that natural wood cleaners are better than store-bought cleaners with chemicals!